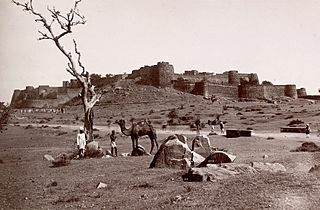 Description: Photograph of Jhansi Fort taken in 1882 by Lala Deen Dayal, from the Lee-Warner Collection: 'Scenes and Sculptures of Central India, Photographed by Lala Deen Diyal, Indore.' The East India Company assumed control of the fort after the death of Raja Gangadhar Rao in 1853. In 1857, the fort was taken over by rebel forces. Although the Rani of Jhansi, Lakshmi Bai, who had been disposed, was not successful in controlling of the fort, she nonetheless defended it against British recapture, which eventually took place in 1858.
Credit: Downloaded by Fowler&fowler«Talk» 11:21, 7 March 2008 (UTC) from the British Library Website. Author: Lala Deen Dayal (1844–1905).